President Henry B. Eyring (born May 31, 1933) served in the Presiding Bishopric from 1985-1992, as a Seventy from 1992-1995, then was called to the Quorum of Twelve Apostles. He has served in the First Presidency since 2007. "Just as pondering the scriptures invites the Holy Ghost, so does daily pleading in prayer. If we do not ask in prayer, He will rarely come, and without our petition He is not likely to linger. 'And the Spirit shall be given unto you by the prayer of faith; and if ye receive not the Spirit ye shall not teach' (D&C 42:14). Heartfelt, constant pleading for the companionship of the Holy Ghost, with the pure intent to nourish our Father’s children, will surely bring blessings to us and to those we love and serve. "It takes a childlike heart to feel the promptings of the Spirit, to surrender to those commands, and to obey. 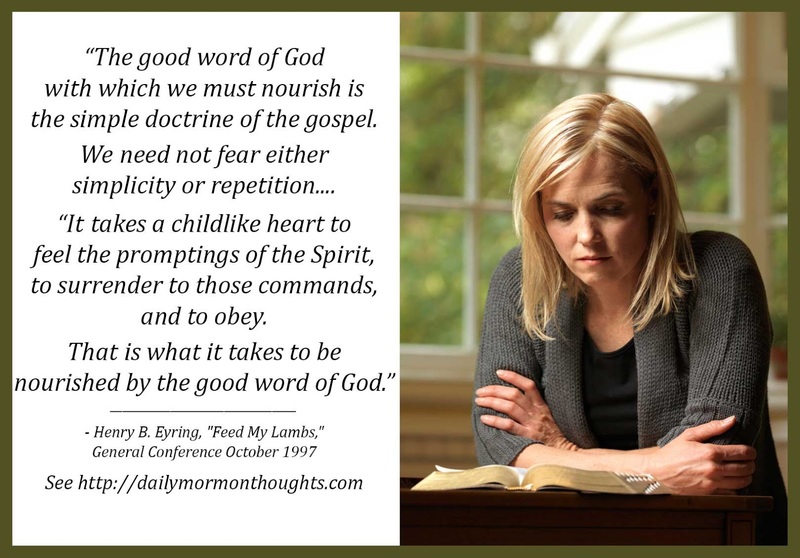 That is what it takes to be nourished by the good word of God." What a beautiful description that is of how we should love and sustain one another! As we learn to focus on "the simple doctrine of the gospel" without concern about repetition or simplicity, we will find continuing blessings for ourselves and for those we strive to serve.